Marina Crouse is an exceptional singer. Her album Never Too Soon is an eclectic mix of soul and blues. It is a mix of English and Spanish. It is American music…California style and it is simply a great album. I suppose the album’s second tune, coming right after a great reading of Bobby Bland’s Touch of the Blues defines Crouse, this album and the Little Village Foundation. That song is an updated version of War’s Cisco Kid…sung in Spanish. Let’s step back a second and acknowledge a cruel fact of life. If War, this great Southern California based band, came out in this day and age, they wouldn’t even have a record contract. They, like much of their home state, were and still are multi-cultural, multi-ethnic and even multi-national. Like Marina Crouse they were simply great musicians. Back in the day, great music would often win out and find an audience and a large audience at that mind you. Now, it isn’t even given a chance. That is until Jim Pugh’s Little Village Foundation steps in and produces musicians who wouldn’t be given an opportunity otherwise. Crouse moves from that slice of urban funk mentioned earlier into a mid-60s Little Milton tune More and More, before visiting a Syl Johnson tune Any Way the Wind Blows. Both tunes are sung with verve, passion and care. Then Crouse sings a bolero, Sabor A Mi. Before the program is all over Crouse visits New Orleans and an Annie Laurie’s rhythm & blues number, It’s Been a Long Time and closes everything out with a Dan Penn/Spooner Oldham composition In the Same Old Way. Somewhere in the mix is even a Bob Dylan tune sung in Spanish and it all works and works in a big way. The entire album was recorded at Kid Andersen’s Greaseland Studios (where else) in San Jose, California. It was Andersen who, along with Jim Pugh, produced Never Too Soon. Andersen plays guitar on all the tracks and Pugh does the same on piano and organ. Drummer Derrick “D’Mar” Martin and bassist Randy Bermudez round out the core band who performs on this CD. The entire ensemble lends sympathetic support and never gets in the way of or distracts from the supple vocals of Crouse. What makes Never Too Soon is the voice and delivery of Marina Crouse. She wields a naturalistic instrument which is imbibed with warmth. It has an unaffected expressiveness that is simply refreshing. Her singing carries with it none of the vocal histrionics and clichés that mar so many female vocalists in this field. They, unlike Crouse, have never taken the time to learn the elusive and subtle dialect of the blues. She performs in two languages, yet seamlessly blends both to deliverer missives in the international language of music. In talking to Jim Pugh, the founder of the Little Village Foundation, some time back he explained that one of the principal missions of the organization is to create cultural empathy through music. Marina Crouse does that all on her own and all on one album. That is quite an accomplishment. 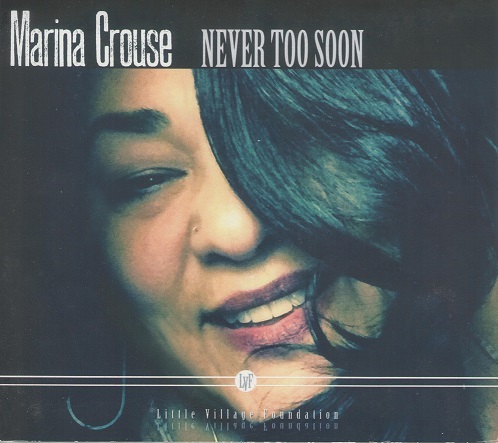 Never Too Soon places Marina Crouse as an early front runner for the 2018 BLUES JUNCTION Productions’ Etta James Award for Best Female vocalist and this CD is, of course, a contender for Album of the Year.